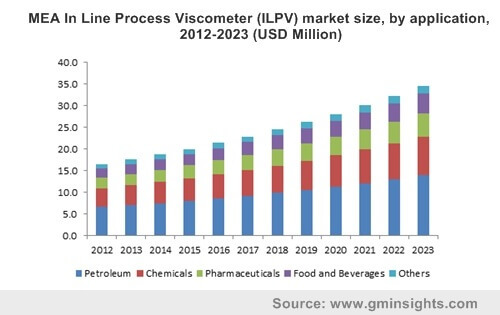 In Line Process Viscometer (ILPV) Market size is calculated to grow from over USD 133 million in 2015, with gains projected at 6.5% CAGR up to 2023. Refining industries capacity expansion owing to rising energy needs accompanied by regulatory emissions norms in oil & gas industry are expected key factors to drive global in line process viscometer market demand. Asia Pacific rotational viscometers market size is forecast to grow at over 6.7% CAGR and reach close to USD 11 million valuation. Large population size coupled with increase in petroleum products demand has encouraged more refineries set up which may stimulate in line process viscometer market growth. Growing competition in oil & gas industry has encouraged companies to reorganize the procedure parameters in refining, which may boost ILPV market size. ILPV provides continuous and accurate real-time measurements of the refined products while the course is still ongoing, which is among the key trend to boost demand. These devices are easy to install into existing course of action. Single or multiple units can be used in a course to keep viscosity track on a regular basis without the need for delay which results in reducing operational cost. This significant feature has lead to global in line process viscometer market size growth. Refineries producing adhesives, oils & lubricants, and other such fluid-based segments are implementing automation for manufacturing procedures which may fuel in line process viscometer demand. These devices are developed to provide continuous measurement and could automatically adjust course conditions to maintain balance. Numerous industry players and cut-throat competition may hinder in line process viscometer market price trend. Inability to perform under reversible flow and multi-channel flow system refineries and adhesive mixing equipment may adversely affect market growth. ILPV is also used in food & beverages and pharmaceutical industry to measure viscosity. Pharmaceutical industry growth in countries such as India and China along with increase in high viscosity liquids use in ophthalmic solutions should probably increase ILPV demand in pharmaceutical applications. Vibrational viscosity measurement technology dominated the demand and estimated to generate revenue more than USD 48 million by 2023. Increase in industrial demand for high quality, accurate and reliable fluid procedure has driven demand in this segment. These devices are used in applications such aslubricants, refineries, adhesives, chemicals, plastics, inks, paper, paints, oils, coatings, shampoos, and foods. Torsional oscillatory viscometer (TOV) market size is projected to gain over 6.8% CAGR up to 2023. Petrochemical, polymer, asphalt, adhesives, and oil refining industries are some of the major applications. Recently, healthcare is noted to adopt this technology to measure human blood viscosity which may stimulate market growth in this segment. Acoustic wave viscometer demand is predicted to gain highest growth rate at over 7.3% up to 2023. Growth in refinery output along with rising demand for petroleum and automotive applications may instigate demand. Petroleum application dominated the industry demand and ought to exceed revenue USD 85 million by 2023. Product quality, procedure yield and efficiency have become the major factors to generate sales due to intense crude oil market competition, which has driven the market growth in petroleum industry. Chemical applications may observe revenue of more than USD 54 million by 2023 owing to increase in trend for automation manufacturing procedure. Chemical industries such as paints & coatings, adhesives, inks and other fluid-based sectors are noted to adopt automation in their manufacturing practices in order to reduce operational cost which is predicted to trigger ILPV demand in this segment. Pharmaceuticals application is calculated to grow at a highest rate at over 6.8% by 2023. Increased use in ophthalmic products owing to expansion in healthcare sector may positively drive in line process viscometer demand. APAC, with major demand from India and China in line process viscometer market size, dominated the regional industry and is anticipated to generate revenue over USD 66 million by 2023. Presence of large scale refineries & chemical industries and consumption due to large population size has influenced inline process viscometer market growth. North America, with U.S. leading the demand, is set to grow at over 6.1% CAGR by 2023. Food & beverages and pharmaceutical applications are predicted to grow at a faster rate in this region. MEA may gain at a rate of more than 6.9% owing to presence of key chemical industries. Acoustic wave and dynamic pressure are noted to be among majorly used technologies. Global in line process viscometer market share is partly consolidated; key companies include Anton Paar, Brookfield Engineering, Cambridge Viscosity, ProRheo. dominated the industry share and accounted for over 12% of the total demand in 2015. Product development in diverse applications is among the key strategy; recently Brookfield has developed new pharmaceutical accessories for the most powerful, economical, stand-alone CT3 Texture Analyzer. Other prominent companies include Lamy Rhelogy, Marimex America, VAF Instruments, Fuji Ultrasonic, Sofraser, Norcross Corp, Endress+Hauser, Bartec Group and Vectron International.